madCMS is a simple website content management system for people who just want to publish content to their website quickly and easily. 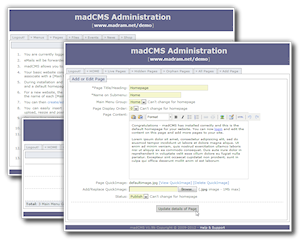 madCMS is intended to fill the gap between the large open-source CMS such as Druple, Joomla or Mambo and the basic blog-style of CMS such as WordPress. madCMS is suitable for people who have outgrown a basic flat HTML website or article-style blog, but don't want to wrestle with the complexity of a large CMS just to update content. madCMS - from Redhead Software. If you need a simple CMS, you'd be mad to use anything else!